Bold Ideas, Big Savings – Share your cost savings ideas! 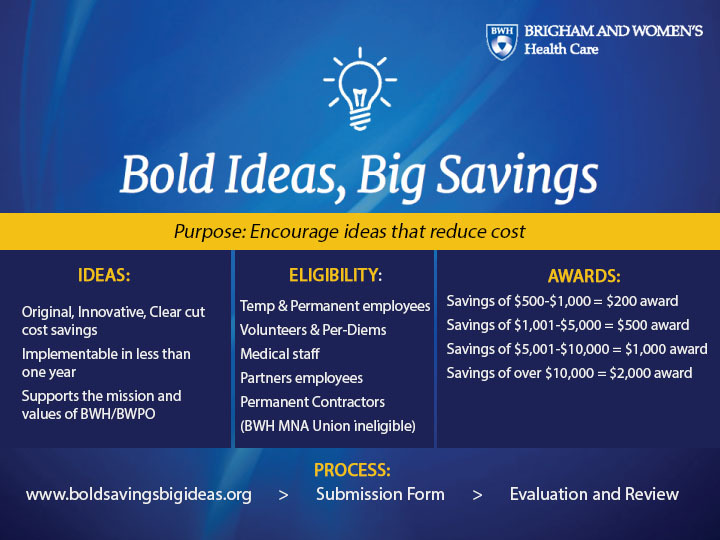 The Bold Ideas, Big Savings program encourages ideas that improve service levels, either by reducing cost or increasing quality at Brigham and Women’s Hospital. Ideas that are accepted and implemented through the program may be eligible for a cash reward based on the amount of savings! Watch BWHC President Betsy Nabel, MD, announce the first winners of the program. Read more about winning ideas!